Through a proprietary process, FDA approved, pure virgin PTFE resin is compression molded around and through a 304 stainless steel, perforated metal insert. After oven sintering, every gasket undergoes a 15,000-volt spark test to check for pinholes. The porous-free PTFE resin 100% encapsulates the stainless insert, isolating it from any fluid contact while in service. TASK-LINE gaskets are molded to size, 1/2" through 24" in class 150# and 300# ANSI ratings with a thickness of 1/8 " or 3/32 " (other thicknesses available upon request). Installation is quick and simple. 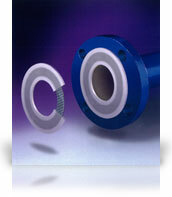 TASK-LINE gaskets are self-aligning and seat easily to any flange in almost any condition. 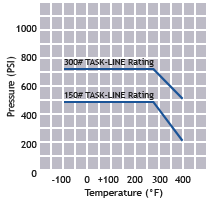 TASK-LINE gaskets have a temperature range of cryogenic to 400°F (consult factory for higher temperatures) and are chemically resistant to: all acids, all chlorides, all sulfates, all bleach solutions, all solvents, all phenols, all caustics, and all peroxides. TASK-LINE gaskets are leak-free and bubble-tight and can be used over and over without sacrificing sealing ability. TASK-LINE gaskets have zero corrosion rates which contribute to lower life-cycle costs when compared to envelope or solid gasket types.